Twitter poster allows to automatically share content from content feeds to your Twitter accounts, as tweets or retweets. To start sharing content you need to set up a Twitter posting campaign. To be able to create a Twitter posting campaign you need to sign up for any of RSS Ground membership plans. You can have one or several posting campaigns running simultaneously, depending on your membership level limits. First thing you have to do in Basic settings is to add one or several of your Twitter accounts. Use Add new Twitter account option. Press "Authenticate" button, follow the steps and grant our app all requested permissions. If you add several Twitter accounts at a time make sure you log out from the previous account to authenticate another one. 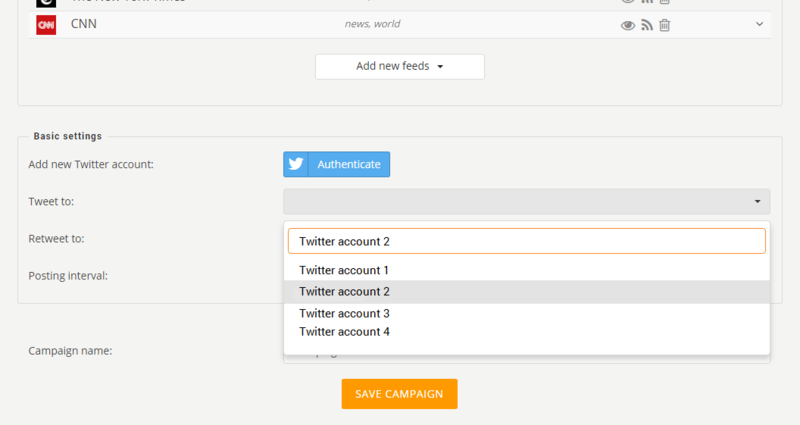 We save all your ever authenticated accounts and you can find them in "Tweet to" drop-down menu. So you can simply select a needed Twitter account from there. 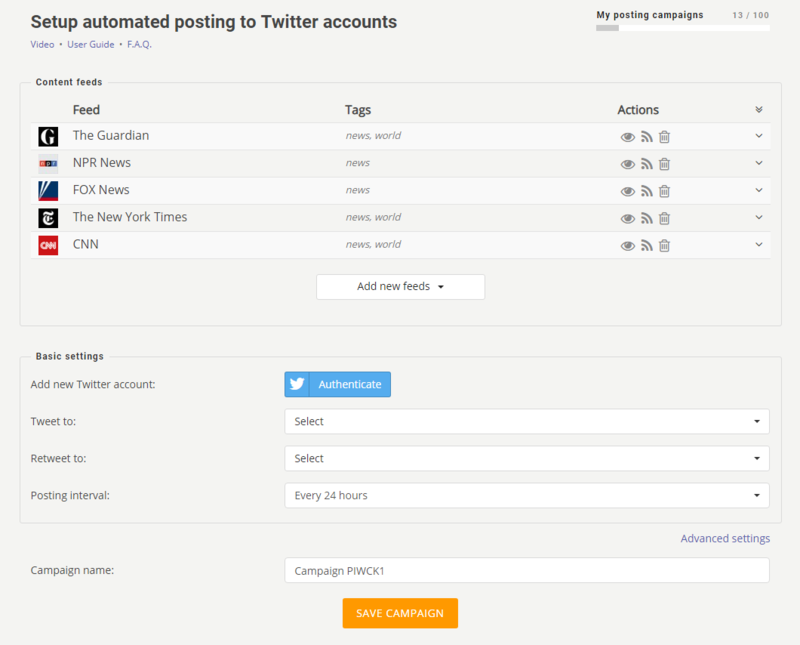 In each posting campaign, you can select only one Twitter account to make posts to. However, you can also select two other Twiter accounts to retweet your main post. Use "Retweet to" option. Note: retweet option is not available for Basic membership users. Please use "Search" option if you have a long list of authenticated Twitter accounts. 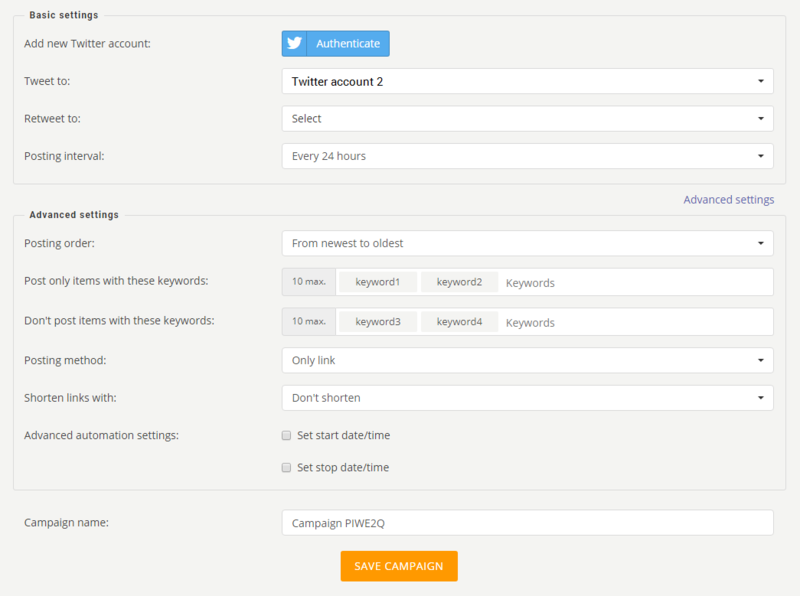 All your Twitter posting campaigns are saved in "Posting Campaigns" section of MY ACCOUNT. See our another user tutorial on how to manage your created posting campaigns. If you wish to post only recent content to your Twitter accounts, you are recommended to use "Only new" option. If you wish to ensure the gradual update of your Twitter accounts, you are recommended to use "From newest to oldest" option. Posting method - you can send your posts to Twitter in two ways. Only link - we will send only a content link to your Twitter account, and Twitter will automatically compile the post. By default it will be: %TITLE% %DESCR% - %LINK%. You can also add short text or some symbols to post mask. But remember, your post (tweet) should not exceed 280 symbols. This includes title, description, link and your additional symbols. Note: it is not allowed to use any hashtags in Posting mask. They all will be removed anyway. We recommend making test tweets with both posting methods to make sure which one better work with your content feeds. 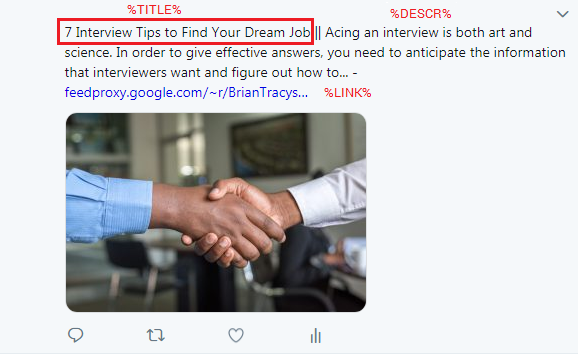 Shorten links with - here you can choose to shorten links in your tweets with one of the shortening services. Some shorten services may require your personal API keys. However, you can choose not to shorten your links and Twitter will shorten them automatically.